As summer winds down we all know the focus begins to shift from parties and living our best life to hitting the mall to have the best for the first day of school. Living in Chicago as we all know is different than the perception of Fox News. We all know the tragedies but are fully aware of what a cool vibrant and artistic place Chicago can be. 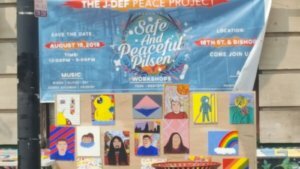 An example of the two coming together is the Safe and Peaceful Pilsen art festival hosted by the J-Def Peace Project. was created by Jeff Abbey Maldanado to honor his son Jeff Maldanado Jr. who was a hip hop artist killed one day after his 19th birthday. The festival showcased artistic works of the students of J-Def which displayed an assortment of variety when it came to the art pieces. The event also offered a DJ, haircuts and a bouncy castle and art workshops for the event attendees. This program uniquely reinforces awareness of the current climate of gun violence while inspiring Chicagoans to utilize creativity to combat the negativity. 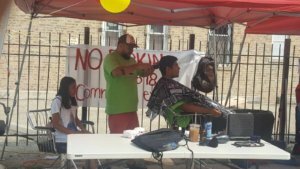 The event was held on the corner of Bishop Street in the heart of the Pilsen community. Despite its start on the South Side the program has extended its reach across the city. Boasting students from different backgrounds and demographics the J-Def Peace Project can be a home for any interested teen. Maldanado senior has turned his personal tragedy into a community transformation for art and awareness. 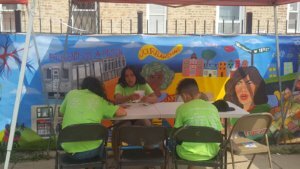 “I think we’re making tremendous impact, so much that we are actually expanding our programs beyond Pilsen. I’m happy to say that in summer 2018 we had five J-Def locations across the city,” said Maldanado. 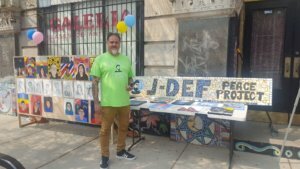 From humble beginnings in the predominantly Hispanic Pilsen community, J-Def has plans on a larger scale to spread throughout Chicago. For those that want to get involved you can obtain more information on their Facebook page The J-Def Peace Project.